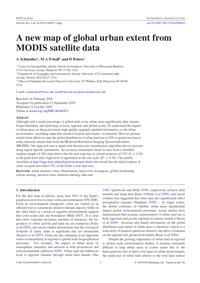 Here we present results from efforts to map the global distribution of urban land use at 500 m spatial resolution using remotely sensed data from the Moderate Resolution Imaging Spectroradiometer (MODIS). Our approach uses a supervised decision tree classification algorithm that we process using region-specific parameters. An accuracy assessment based on sites from a stratified random sample of 140 cities shows that the new map has an overall accuracy of 93% (k = 0.65) at the pixel level and a high level of agreement at the city scale (R >2 = 0.90). Our results (available at http://sage.wisc.edu/urbanenvironment.html) also reveal that the land footprint of cities occupies less than 0.5% of the Earth’s total land area.